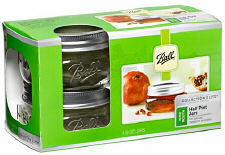 Ball Collection Elite Brushed Silver Wide Mouth Half Pint (8 oz.) Jars capture your creativity. Perfect for sharing, this jar has a contemporary style that is ideal for creative preserving and storing. Elegant enough to take your flavored mustards, savory dressings, luscious chutneys and fruit-filled jams from the kitchen to the table, these uniquely shaped jars hold endless imagination. The Ball brand helps keep your creations fresh and beautiful!